The term wisdom teeth might bring back memories of resembling a hamster and eating a lot of soup, but many do not know what or why wisdom teeth exist or have to be removed at all. The wisdom teeth are the third and last molars on each side of the upper and lower jaws. They are the last adult teeth to erupt and usually make an appearance during the late teens or early twenties. Wisdom Teeth will sometimes emerge crookedly as the rest of the adult teeth that came before often take up most of the space in the mouth. This can lead to painful crowding, disease, and impaction, which means the tooth gets stuck below the gum line. Impaction can result in some swelling and tenderness of the area. When this happens, extraction is not far off. To ease the swelling, an ice pack may be laid over the jaw. The coldness will reduce inflammation and ease discomfort. After surgery, when the anesthesia wears off, pain and swelling will set in. Swelling is normal and will not reach its maximum until 2-3 days after surgery. 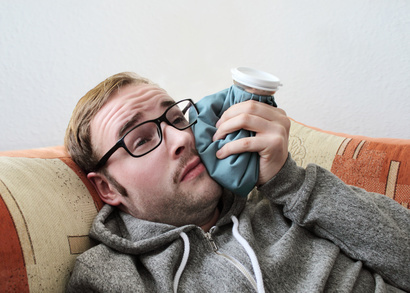 An ice pack can be wrapped in a towel and applied firmly to the cheek adjacent to the surgical area to help reduce the swelling. A small amount of bleeding is also possible and should treated gingerly. Keep the gauze packs firmly in the mouth for the first hour unless heavy bleeding requires them to be changed. If the bleeding persists, place more gauze in the mouth and hold firmly in place for about 30-45 minutes. Solid food, coffee, alcohol, cigarettes, soda and hot beverages should be avoided so as not to irritate your mouth further. Brushing, flossing, spitting, and rinsing of the teeth should be abandoned until day 2 at least with longer encouraged in certain cases of extreme sensitivity. Rinses should, however be done at least 2-3 times a day after meals to minimize bacteria in the exposed site. There are many ways to minimize recovery time including lots of rest, water, over-the-counter pain relievers, and prescription painkillers prescribed by your oral surgeon if you are particularly sensitive to pain. Rinsing the mouth with salt water frequently can help keep it clean and free of infection. Soft foods such as cottage cheese, applesauce, pudding, yogurt and soups that have cooled to room temperature should all be eaten for the first few days until other foods can be reintroduced back into the diet. It is best to specifically avoid any small foods that can lodge in the socket areas, such as nuts, rice, sunflower seeds, or popcorn. Exercise should be avoided for 3-4 days following surgery. In the days following surgery, strong discoloration or bruising might appear which is due to bruising beneath the tissues of the gum. This is normal and usually appears within 2-3 days after surgery. If you notice any unusual symptoms like discharge, severe pain, or fever, give us a call right away.